With complex conditions like diabetes how can I make sure I cover all the concerns with the patient during the consultation? Diseases such as diabetes affect a wide range of body systems and functions. This can include the brain, eyes, heart, kidneys, arteries, pancreas, nervous system and the feet. In fact the condition can literally cause damage from the top of the head to the bottom of the foot. In discussions with patients it may be easy to omit or skip over a particular complication that may be present if diabetes is not managed and lifestyle chances are not put in place. Using 3D diabetes models will keep your discussion focused. This will allow you to cover all the complications and effects of the condition in a logical and informative fashion. The card can be used as an outline for the discussion with the patient while still allowing a lot of flexibility to discuss the specific concerns of the individual. What models are good accompaniments to 3D diabetes models in a patient room or a medical classroom or laboratory? Having 3D diabetes models in a patient treatment room or in a training or teaching environment is a great idea. 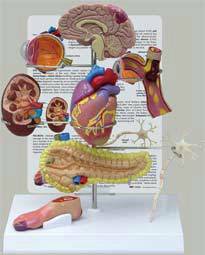 Other anatomical models that show diseased organs that highlight the impact of diabetes are also beneficial. Yet another option to consider is an anatomical chart of the effects of diabetes on the human body. Adding as many different visual aids as possible will help students and patients alike to develop a full understanding of this prevalent health condition. Another benefit to using supplemental information forms such as anatomy charts, brochures or supporting models to the diabetes model is that each may have a slightly different representation of the specific damage to an organ or body part. This can lead to discussions about what each patient can expect given their unique individual diagnosis. When making presentations to small groups about diabetes what props can I use to help clarify understanding? 3D diabetes models that are provided at each table or for each small group of individuals is a great addition to any type of training program. This may include patient groups, family members, students or the community at large. Using overhead presentations with diagrams and pictures with the model is highly effective in helping everyone see and visualize the specifics you are addressing in your presentation. Are comprehensive 3D diabetes models cumbersome to move around a hospital or a teaching environment? Many model manufacturers are very aware of the need to move models and supplies from one area of a facility to another. High quality 3D diabetes models can easily be moved from area to area or room to room without a lot of complications. Lightweight and just about 10 inches in height the model can be carried by one person with no difficulties at all. The solid construction of the model helps to ensure it is very practical and will last for years with a minimum of specialized care and attention.